Featuring a thermoplastic coated 3/4" # 9 expanded steel 46" x 46" top (3 Seat ADA - 46" x 57", 2 Seat ADA - 46" x 68") with a 2" radius rolled ribbed steel edge. Comfortable seats are made of 11 gauge rolled ribbed steel. Both tops and seats are finished with a slightly textured Polyethylene coating for long-lasting durability. 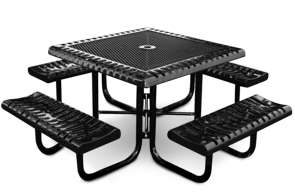 The portable picnic table frames are made from 2" or 2-3/8" galvanized steel tubing with a powder-coating available in any of the color options shown below. Optional umbrellas and a plastic/concrete Umbrella Stand are available to order. Surface Mount Clamps and In-ground Mount Posts can also be ordered to help protect against the possibility of undesired movement of the square picnic table.